Our range of products include non woven shopping bag, printed non woven bag, printed non woven carry bag, plain non woven bag, promotional non woven bag and colored non woven bag. With firm commitment towards quality, we are offering an excellent quality D Cut Bags which are extensively used to carry things. Our offered bags are made available in alluring patterns and different designs. 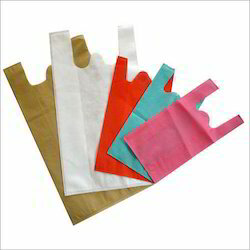 Our valued clients can avail these bags in various sizes according to their variegated needs at market leading prices. Apart from this, these bags are highly in demands for their smooth finish. Matching up with the requirements of our clients, we are into offering an enormous quality range of¿¿ Bag to our clients. This¿¿ Bag is highly acclaimed amongst our clients, owing to its robust design and sturdy construction. We can also customize these products following the requirements of our clients.We are the leading manufacturers and suppliers of NON WOVEN BAG in Tamilnadu, Karnataka,Trivandrum , Cochin , Kottayam , Ernakulam, Coimbatore, Bangalore, Tirupur, Karur, Salem, Erode, Krishnagiri, Chennai, Vellore, thoothukudi, Madurai, Kerala, etc. In order to meet the requirements of our clients, we are instrumental in offering a vast range of W Cut Bag to our clients. This W Cut Bag is used as promotional shopping bags by our clients. We offer these products in different sizes to suit the requirements of our clients. We are the leading manufacturers and suppliers of NONWOVEN W-CUT BAG AND NONWOVEN VEST BAG in Tamilnadu, Karnataka,Trivandrum , Cochin , Kottayam , Ernakulam, Coimbatore, Bangalore, Tirupur, Karur, Salem, Erode, Krishnagiri, Chennai, Vellore, thoothukudi, Madurai, Kerala, etc. 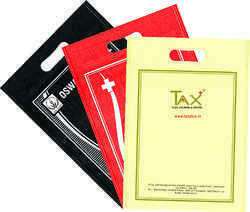 Being a client-oriented firm, we are engaged in offering an exclusive range of Printed D Cut Bags. The provided bags are designed using premium grade fabric with the help of advanced machines under the supervision of deft professionals. The offered bags are widely acclaimed for their tear resistance property and high strength. In addition to this, we offer these bags to our clients in different sizes, prints, designs and colors at affordable prices. Catering to the needs of our clients, we are into presenting an enormous quality range of Handle Bag to our customers. This Handle Bag is widely used to carry groceries, food items and garments. We also check these products on several quality parameters before shipping. 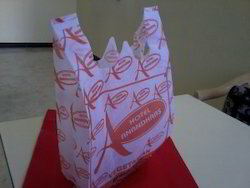 Keeping the diverse requirements of customers in mind, we are involved in offering superb quality range of Printed Bag. This Printed Bag is available in different sizes, patterns and designs according to the client's demands. Our product range is made by using quality material which we purchase from our reliable vendors. We are the leading manufacturers and suppliers of NONWOVEN PRINTED W-CUT BAG in Tamilnadu, Karnataka, Trivandrum , Cochin , Kottayam , Ernakulam, Coimbatore, Bangalore, Tirupur, Karur, Salem, Erode, Krishnagiri, Chennai, Vellore, thoothukudi, Madurai, Kerala, etc. Looking for Nonwoven Bags ?